Albany, we have a problem. The latest New York City census of homeless shelters-- taken Friday -- counted 52,150 people who had gone to public facilities in search of the basics: a bed, a hot shower and a roof over their heads. This surging tide of displaced individuals continues to keep homelessness near the highest level ever recorded in the city -- and a closer look reveals even worse news. Most of those seeking shelter, about 38,000, are in families with children. We're talking about appoximately 15,500 adults and 22,500 children. Many of the adults in these families are working, the city says. They're just not making enough to pay rent. Mayor Bill de Blasio in the last couple of days has put a plan on the table to relieve some of the problem. 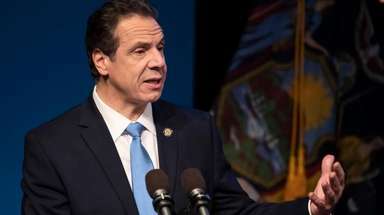 He wants Albany -- in the budget it's hashing out now -- to let the city spend $23 million a year from its share of state Temporary Assistance for Needy Families funds. He would use the cash to subsidize rents for 1,400 to 2,800 working families left out in the cold. But Gov. Andrew Cuomo is balking -- and his reasons make sense. City Hall needs to submit a coherent, detailed plan if it wants state negotiators to change the budget for this new request. And de Blasio -- focused like a laser on prekindergarten issues for most of his three months as mayor -- arrives at the party without a detailed plan. The budget is due April 1. So an instant accommodation is all but impossible. And next year is too long to wait. De Blasio acknowledged some "miscommunications" with Albany on the issue Tuesday. We'll take that as a confession he was caught short as the city's homeless problem began to veer out of control. But this isn't really about de Blasio and Cuomo. It's about thousands of children and their working parents who are struggling to make ends meet. If Albany can't help the city in the budget package due next week, it must help find a solution when the budget is done. Too many families are living on the fringes. Too many kids are suffering. We have to address that and fix it.